People gather at a makeshift memorial to honor the victims of an attack, near the area where a truck mowed through revelers in Nice, France, July 15, 2016. The timing of Valls’ statement may have struck some as insensitive, but to others, there was a sense that it reflected reality. Daniel Benjamin, a former coordinator for counterterrorism at the U.S. State Department, called the statement wise. French officials said Friday that 84 people were killed and 52 were critically wounded when a man drove a large truck through a Bastille Day celebration in Nice late Thursday. French police identified the attacker as Mohamed Lahouaiej Bouhlel, 31, a French-Tunisian who lived in Nice. President Barack Obama struck a corresponding note, saying Americans and allies could not give in to fear, turn on each other or sacrifice their way of life. Blaise Misztal, director of national security at the Bipartisan Policy Center in Washington, noted that Obama’s and former President George W. Bush’s calls for resilience in the face of terrorism have not been all that different from the French prime minister’s. 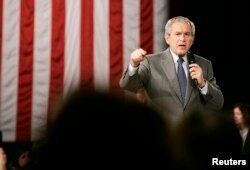 FILE - U.S. President George W. Bush speaks about his administration's war on terror while at Tippecanoe High School in Tipp City, Ohio, April 19, 2007. He added that the “normalization of terror attacks” should be part of any counterterrorism strategy. 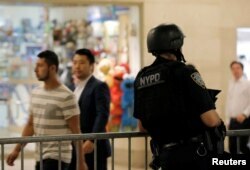 A New York Police Department officer stands guard in Grand Central Station following the Nice terror attack, in New York City, July 15, 2016. But after the December attack in San Bernardino, California, U.S. public concern about terrorism shot up to levels not seen since 9/11. A March 2016 Gallup poll showed that 48 percent of Americans worried a “great deal” about possible terrorist attacks in the U.S., a level higher than the 2004-2015 period. A June 2016 NBC/Survey Monkey poll taken after the Orlando, Florida, shooting — the worst mass shooting in U.S. history — showed that the share of Americans who viewed terrorism as the most important issue to them doubled to 24 percent from 12 percent prior to the attack. The poll also showed that 51 percent of Americans worried that they or someone in their family might become a victim of terrorism, while 48 percent said they were not worried. “These numbers are off the charts,” Benjamin said. Following the attack in Nice, American anxiety over terrorism is likely to edge higher, but the U.S. remains less vulnerable to the type of complex, large-scale terror attacks that have struck Europe over the past two years. The U.S. is geographically isolated from the Middle East, has better law enforcement and domestic intelligence, and has lower levels of radicalization among an immigrant population that is much better integrated into society than is the case in Europe, Benjamin said. “These can’t be reasons to be complacent, but the threat here is lower than it is in Europe,” he said.